Ichigo's firm resolve gives him great power. His resolve can be seen in his eyes. The background is made after a screenshot of Hueco Mundo. Nice background, you can tell that you have had some experience at wallpapers. I like a lot! The bg is waaaaay blurry compared to Ichigo. I know he's in the foreground, but there should be a little more definition in the landscape behind him. 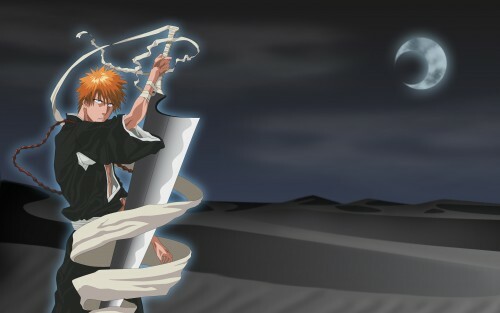 yeah, I love Ichigo... but zangetsu is not bad too...! I like this type of pictures. As a wallpaper - awsome. XD great job! its a really nice wallpaper! thanks for sharing it!